We live in a glorious age. There was a time not long ago when, if you wanted to enjoy some piratey fun, you couldn’t simply fire up the computer or break out the smartphone. There was a time when you had to use wooden swords, or perhaps some books with dice and mounds of scratch paper. Of course, there was another time not so long ago when many of the tabletop adventures took place in card form. I mostly missed out on those days – just a tad too old to get into Magic the Gathering or Pokemon. 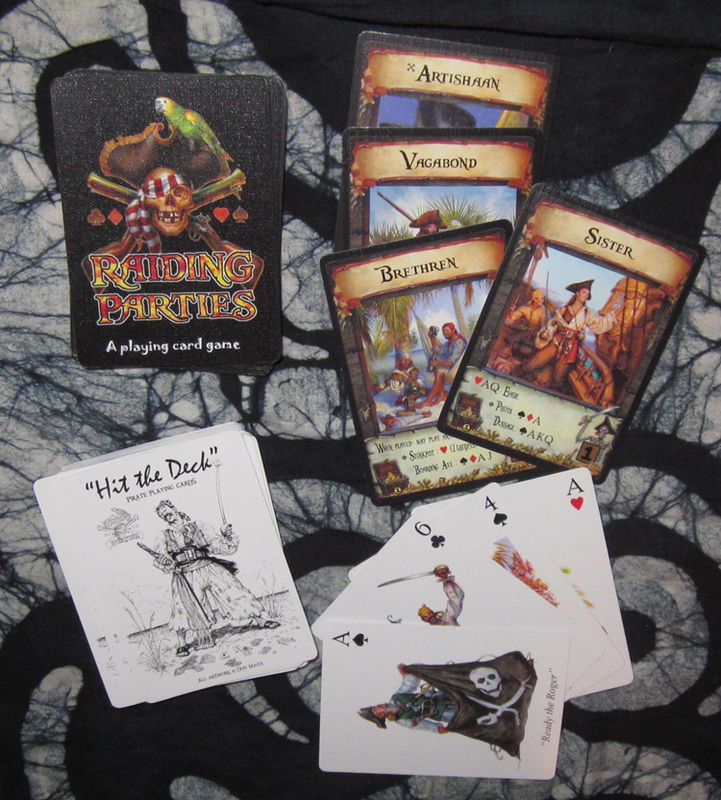 And this is why I shiver in fear whenever a pirate card game comes along – it’s not their fault, but I’m somewhat mentally stunted when it comes to card games. No worries with Raiding Parties, however. If you can get past the initial hurtle of ??? and do a few quick dry runs with the rules, you’ll be 90% competent in no time. The other 10% you might need to fill in the gaps with some house rules, but then you’re golden. Raiding Parties is a game consisting of two or more decks – one specialized deck full of a band of scalliwags with different weapons and skills, and the other a “normal” deck of cards. I use “normal” in quotes because it could be played with any deck, but Raiding Parties thoughtfully includes a special piratey deck just for this purpose *. Two or more players square off, their selected crews inhand. One by one they set their pirates against one another, declaring their means of attack and then drawing cards from the normal deck to determine success. The opponent, if still standing, can then retaliate, and so it continues as crew are picked off one by one until a single player stands victorious, and the other’s crew has been blown to smithereens leaving the defeated player to sob like a Spaniard until the winner buys him a rootbeer float and everybody is friends again. Gameplay starts slowly while learning the rules, but after even a single bout the back&forth takes on a pleasant rhythm. Playing with a landlubber, though, will surely slow the pace as they ask such silly questions as “What’s a dussage?” or “Isn’t a Muskatoon what they call members of the Mickey Mouse Club?” Indeed, there’s more than a little terminology that might be unfamiliar to the uninitiated, and while it doesn’t directly affect gameplay, I’ll admit that even I had more than a little trouble imagining what exactly it meant when my Vagabond charged Sister with a Gully. Both decks, gaming and normal, are graced throughout with art from the illustrious Don Maitz, surely the most accomplished pirate artist of our time. And if you’ve been to a festival or two, you might even recognize a few of the faces captured. It’s a fun game with a decent pace. A fine way to burn off a rainy afternoon without making a long term commitment. *A fully functional deck of cards, true. But with the pips in the right corner rather than the standard left, you might want to steer clear on poker night unless you’re looking to give an advantage to your left-handed friends. This entry was posted in Games and tagged card games, don maitz, raiding parties by Bilgemunky. Bookmark the permalink. Is that from the same people who made Pillage and Plunder? Raiding Parties by Nick Pace, Set 2 on the way! Plz check out our website!! Thanks for this review of the game. This might be a good game for the kids to play in a party (which we will be having soon). HUZZA!! Wonderful game, Fantastic Art, QUALITY GOODS, and a very dedicated vender who values his patrons and shows it every bit along this journey. While I have not met the inventor of this game, I have had some correspondence with him and he takes his customers very seriously and shows he wants your return patronage – so I got a deck fer some mates too! !